Do you have everything for Back to School? New outfits, shoes, backpack, lunch bag, binders, pencils, crayons etc. Have you had the chance to think about what to pack for snacks? Back to School can be very exciting but it can also be very worrisome as packing lunches can be very hard to do with picky eaters and also schools being Nut-Free. What do you pack? Trying to find a balance of healthy snacks that are quick, easy and inexpensive is challenging. I want to let you in on a fun way to get your kids more involved with packing their lunches and eating them too. Popcorn! Yes I said popcorn. Asking children to help build their lunch can get them excited about the regular back to school snack packing routine - making life easier for parents in the process. Orville Redenbacher's Smart Pop is a delicious, satisfying snack that is also a good source of fibre and whole grains. It is 94% fat free and only 100 calories for 6 cups. On Sunday nights spend some time preparing snacks for the week, and then let the kids choose what to pack each morning. This sense of ownership can help to ensure kids eat the lunch they leave for school with! Looking for easy snack packing tips? Pop extra popcorn the night before and package in individual resealable snack bags to retain just-popped freshness. For a fast flavour hit, place freshly popped popcorn in a large bowl, sprinkle taco seasoning or parmesan cheese to taste and shake until gently coated. 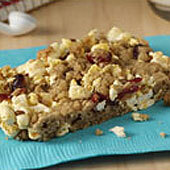 These bars are very easy to make and usually we have all the ingredients in the house. I didn't have cranberries this time but we substituted with raisins as we always have them around. They are quick and easy to make, easy for the kids to help also. I do find I have to really watch my microwave when popping pop corn. I have to use the low end of the time or I will end up with burnt popcorn. The bars smell great in the oven and while they were baking I had enough time to clean up the mess and start working on other things. These will be a great afternoon snack to prepare when the kids get home from school. This is a great snack and was enjoyed by all! Try other recipes on Orville Redenbacher's website. Num num! Hi, I am following you from the Canadian Blog Hop. Please feel free to stop by Horseshoes and follow me back. You reminded me to pop some Orville for BTS tomorrow ;) Excellent!